Chicken is reputed to be the healthiest of all the meats. Certainly it is one of the most versatile. Our chicken recipes range from chicken Cordon Bleu to kebabs. Click any description below to be taken to the full recipe all of which have been tested at least twice. With our step by step pictures this dish is easy. Layer a chicken piece with ham and gruyere cheese. Then cover in golden breadcrumbs and fry for a few minutes. 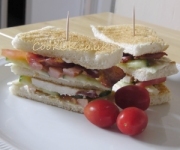 Frequently served in pubs and clubs but not often made at home, this is the king of sandwiches, even more so when homemade. Chicken breasts coated in a crunchy peanut butter and coconut milk sauce. Grill them or barbecue them at high heat for a delicious real chicken satay. Chicken, ham, leeks and onion topped with short crust pastry makes an excellent meal. It also cooks very well from frozen. This is almost a one pot casserole because it contains carrots, shallots and mushrooms as well as chicken and bacon. Serve it to the table in the casserole dish and let everyone spoon out as much as they want. Fancy something a bit more exotic? Then try our Balsamic Vinegar chicken for a change. The spicy butter beans are delicious as well. A delicious taste of Italy with chicken in a creamy and savoury sauce. A quick chicken curry with only 15 minutes preparation and 30 minutes cooking time. It's extra tasty and can be cooked from frozen. 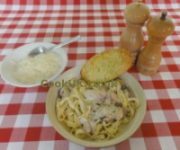 We lost the pictures for this recipe but it's easy to prepare and cook. 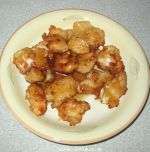 Chunks of chicken marinated in a Turkish mix. Great for the barbecue or cooked under the grill. An Italian style kebab. 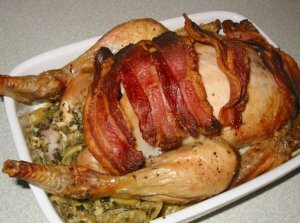 Strips of chicken and bacon spread with a tomato paste are rolled up and then sliced. The result are delicious kebabs that look superb. Marinate the chicken pieces in a lemon based mix. Place them on a skewer with lemon slices and green peppers for a delicious kebab. Can you prepare and cook a roast chicken in less than 90 minutes? You can if you do it our way. And it tastes great as well! One of our best kebab recipes. Chicken marinated in soy sauce and honey. So easy to prepare yet so tasty. If you only give one of our kebab recipes a try, make it this one. 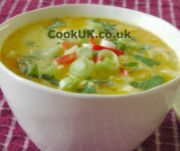 Very quick to prepare and cook, this recipe has easy to find ingredients which gives the chicken a very authentic Thai taste. A quick and easy chicken dish that has that authentic Chinese taste. Add some rice and bean sprouts and you have a tasty main meal. A traditional Hungarian dish of chicken, sweet peppers, paprika, wine and yogurt. A chicken dish with a difference. This original paella from Valencia uses chicken, rabbit and other meat but no fish. This recipe sticks to chicken and tastes delicious. This is a Spanish tapa dish of chicken coated in crispy batter with a honey and mustard sauce. Give it a try, our step by step pictures make it easy to cook. A mild chicken curry with a delicious aroma. Lentils thicken the sauce giving it a creamy texture. We cooked ours in a slow cooker but the same dish can be cooked on the hob at a low temperature. We show you how to make chicken soup using real chicken stock as the base. Thicken it up with a potato, serve with fresh bread and you have a taste of real heart-warming food. A tasty Italian version of Chicken Soup with lots of pasta, tomatoes and courgettes.